This page presents our translation of a contemporary review of the concert which Berlioz organised and conducted on 19 January 1845. 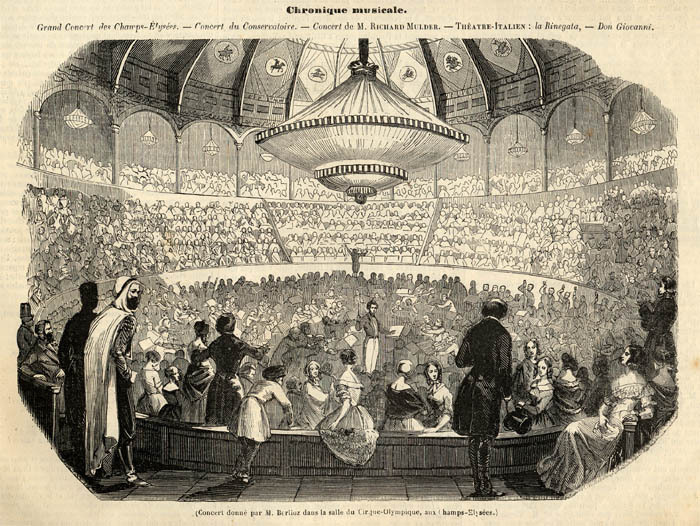 The concert was held at the Cirque Olympique, also known as the Cirque des Champs Élysées, and was the first of a series of four large-scale concerts he gave there between January and April 1845. The programme included the first performance of the new overture La Tour de Nice, subsequently revised by Berlioz to become the Corsair overture (Berlioz composed La Tour de Nice during his second visit to Nice in 1844). The original French text of the review appeared in L’Illustration on 25 January 1845, a copy of which is in our collection. The images which accompany the text below were scanned from this issue. M. Berlioz is an indefatigable athlete and insatiable conqueror. Hardly has he brought one undertaking to a successful conclusion that he is already dreaming of another; his only way of recovering from the stresses of one battle is to lay the plans for the next one. I would wage that last summer, while conducting the performance at the ‘Great Festival of Industry’ he was already preparing the groundwork for the ‘Great Musical Festival’ which has just taken place. The distance from the place where our national industries were exhibited last year to the Cirque des Champs Élysées, is in truth very small, just a few steps away: you only need to cross the broad alley. While waiting for the concert hall which some newspapers were advising the local administration to build – but giving advice does not mean having to pay – M. Berlioz could find there a ready-made concert hall, decorated in a sumptuous but tasteful way, whose vast dimensions are eminently suited for the deployment of immense tonal resources in which he delights and glories. It is certainly the case that the Cirque des Champs Élysées has proved to be far more suitable for music-making than the immense and shapeless shanty where the Industrial Festival was given. No more reentrant angles, no deafening stretches of canvas, but well-proportioned dimensions, a round cupola, under which the harmonic vibrations could expand in an even and regular way… Music was there in its natural environment, and last Sunday’s three hundred and fifty performers had twice as much impact as the nine hundred and fifty of a year ago. Among all the pieces played in this concert only one was new. It is a piece called Overture of the Tower of Nice, probably because M. Berlioz composed it in that city where he recently made a trip. It is an extremely original composition, full of weird effects and bizarre flights of fancy. It is like a tale by Hoffmann. It plunges you into an indefinable malaise; it torments you like a bad dream, and fills your imagination with strange and terrible images. It must be the case that nowadays this tower is inhabited by hundreds of owls and ospreys, and the surrounding ditches must be filled with snakes and toads. Maybe it served as a lair for brigands or was the fortress of some medieval tyrant. Perhaps some illustrious prisoner, some innocent and persecuted beauty, expired there in the pangs of hunger or under the executioner’s sword. You can imagine and believe everything when you hear these strident violins, croaking oboes, lamenting clarinets, groaning basses and moaning trombones. The Overture of the Tower of Nice is perhaps the strangest and most peculiar composition to have been created by the imagination of a musician. The Carnaval romain overture is also very original, but much less bizarre. L’IIlustration analysed it last year, and does not need to return to it. It produced its usual effect and the audience applauded it vigorously. The Dies irae had the same success. At the tuba mirum, the successive entries of the trumpets and trombones placed at the four corners of the orchestra shook the vast hall on its large foundations, but it did not collapse, and that is to the credit of the architect who built it. I would like to know the name of this architect in order to recommend him to proprietors who love solid constructions. Leaving hyperbole and jokes aside, M. Berlioz’s tuba mirum is a movement which demonstrates great power and one cannot hear it without being strongly moved. The chœur du sommeil, from Atys, Piccini’s celebrated work, is very expressive; it induces somnolence in you, as Vergil says: suadent cadentia sidera somnos. Is Piccini not effectively a fallen star? Madame Eugénie Garcia performed with exquisite taste, pure and severe style, and much intelligence and expression, wonderful scenes from Alceste, which unfortunately cry out for dramatic enactment. In these Madame Garcia made a great impression, but how much greater it would have been if she had performed this powerful music with a costume and on stage, and if she had been able to complement her singing with the indispensable accompaniment of her gestures and body language! M. Ponchard sang well the great scene from Orphée, and I have nothing but praise for Messrs Haumann and Hallé; the former performed an air of his own composition, and the latter the concerto in E flat by Beethoven. I am sure that M. Haumann loves his music very much; I will forgive him, on condition that he forgives me for loving that of Beethoven. And the best taste is your own. The Hector Berlioz Website was created by Monir Tayeb and Michel Austin on 18 July 1997; this page created in 1 April 2012.